As someone who made one or two commercials in the past, I can’t say all that much about the creative merits of this particular commercial except it didn’t really motivate me to buy an Audi. But that’s not really the purpose of this commercial anyway. What’s the purpose then? Well, that’s debatable. However, to a Star Trek-loving geek like myself, I also say it’s pretty irrelevant. I just loved it because I get to see two great actors, who’ve played one of the most iconic characters in history, have a bit of fun. Plus, after today’s earlier sad news, I could use a bit of fun. 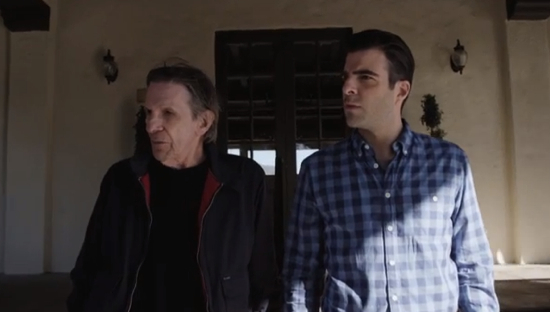 The two actors in question are Leonard Nimoy and Zachary Quinto who, of course, both played Spock in various incarnations of Star Trek. The commercial in question is “The Challenge” and in it Spock battles Spock to see who can get to the golf course first. The loser buys lunch. Who wins? Well, I won’t spoil it for you except to say that the solution found by Spock is highly logical, pretty darn funny and a great twist. Check out the commercial after the break. For latest information you have to go to see internet and on world-wide-web I found this site as a best site for most up-to-date updates. Great issues altogether, you just gained a brand new reader. What would you recommend in regards to your put up that you made a few days ago? Any positive?